The Parish Meeting will follow the Divine Liturgy this Sunday. (The Restoration of the Holy Icons). 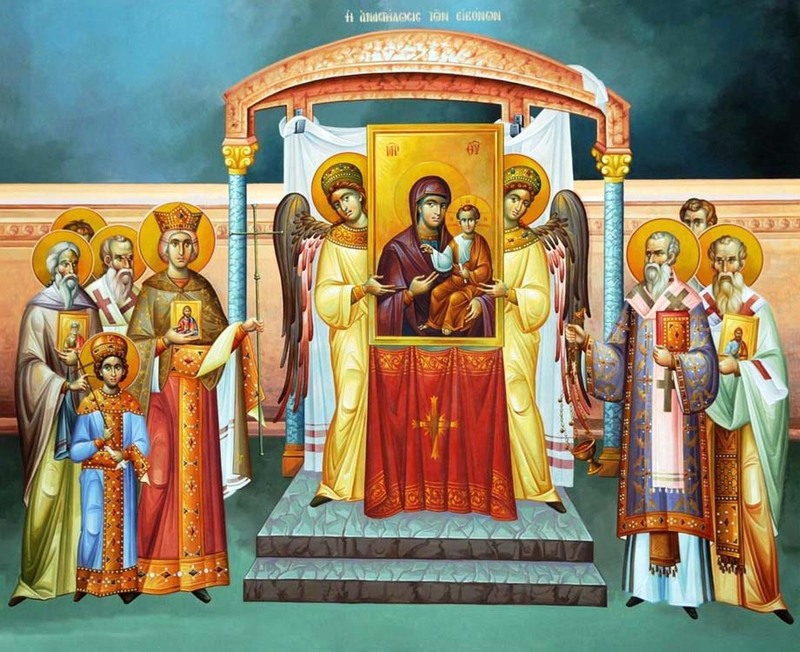 Divine Liturgy is at 10:00 a.m. Sunday morning, proceeded by Matins at 9:00 a.m.
Be Thou entreated for the sake of the sufferings of Thy Saints which they endured for Thee, O Lord, and do Thou heal all our pains, we pray, O Lover of mankind. Thou, O Lord, will preserve us and keep us from this generation. Brethren, since we are surrounded by so great a cloud of witnesses, let us also lay aside every weight and sin which clings so closely; and let us run with perseverance the race that is set before us, looking to Jesus: the Pioneer and Perfecter of our faith, Who for the joy that was set before Him endured the cross, despising the shame, and is seated at the right hand of the throne of God. Consider Him Who endured from sinners such hostility against Himself, so that you may not grow weary or fainthearted. In your struggle against sin you have not yet resisted to the point of shedding your blood. And have you forgotten the exhortation which addresses you as sons? “My son: do not regard lightly the discipline of the Lord, nor lose courage when you are punished by Him; for the Lord disciplines him whom He loves, and chastises every son whom He receives.” It is for discipline that you have to endure. God is treating you as sons; for what son is there whom his father does not discipline? If you are left without discipline, in which all have participated, then you are illegitimate children and not sons. Besides this, we have had earthly fathers to discipline us and we respected them. Shall we not much more be subject to the Father? 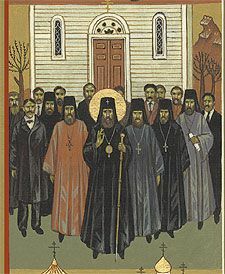 The Service of the Triumph of Orthodoxy may be found here, courtesy of Monachos.net. On this day, the first Sunday / Resurrection day after we have fully embarked upon the course of the Fast of Great Lent, with its emphasis on repentance, fasting, and renewal, we seem to immediately shift from the penitential mood to a jubilant celebration of victory for the Church and for the wonderful Good News of the incarnation of God in the flesh and all of His saving acts for us. The First Sunday in Great Lent is set apart to glorify what is known as “The Triumph of Orthodoxy,” when the upheavals (sometimes violent) of Iconoclasm, which tore the Church [and the society of the Byzantine (East Roman) Empire] during the Eighth and Ninth Centuries A.D., were finally (… eventually…) resolved, in the events leading up to, during, and after the Seventh Ecumenical Council. Many see the emergence of the attack on holy images as perhaps reflecting the influence of Islam, which was then rapidly expanding from Arabia, and engulfing militarily and culturally the long-Christian lands on the periphery of the Byzantine Empire; other emphasize that the debate over the role of icons in the Church was a continuation of the doctrinal wrestling with the nature of Christ which had gone on over the course of the previous four centuries (or longer). Many scholars see the outbreak of state-sponsored iconoclasm as stemming from the “Isuarian” emperors (actually Northern Syrian), Leo III and Constantine V, who both grew up in a tradition of the Church which tended to emphasize the humanity and earthly reality of Christ and were perhaps in favor of “purging” the Church from what some Syrian (and other) monks viewed as a slip into idolatry, with icons, indeed, perhaps sometimes being worshiped or taken almost superstitiously as talismans of protection or good fortune. After a council which claimed to be “ecumenical” had been called by the emperor and forbade icons as idolatry, the tide turned and the Seventh Ecumenical Council upheld the importance of icons in light of their importance for a true understanding of the nature of Christ: the incomprehensible, uncontainable, unimaginable God could be depicted, because he had deigned to take on our circumscribable human nature. Icons, too, as Saint John of Damascus (who wrote, ironically, from the relative safety of an area under Muslim, not Byzantine, rule…) serve to instruct the faithful, and the honor passed to the image is really given unto the ‘prototype’ – God himself, who became portrayable, and who is reflected in his saints, who are made in the image (ikon) of God and grew into the fulness of His likeness by holiness. The restoration of the icons is the “triumph of Orthodoxy” because it reveals the profound truth of the saving reality of the Incarnation of Christ: God-with-Us. The Week Leading up to… Sunday, March 16th, 2014.